Macri’s tentative recovery can be attributed to his willingness to tell people that the next few years will be full of difficulties. For two-and-a-half years Mauricio Macri did his best to persuade us that putting an end to Argentina’s slide from riches to rags – which began well before most of the country’s inhabitants were born and is still going on – would be a piece of cake. After repairing the damage done by the Kirchnerite administrations – a task he apparently thought would take him no more than a couple of months – his team of CEOs would do whatever was necessary to make the economy internationally competitive without inconveniencing anyone apart from a few crooks and freeloaders. Amazingly enough, for a while Macri’s happy-go-lucky approach, symbolised by those yellow balloons among which he liked to dance, seemed to be doing the trick. But then the floorboards shifted and he came crashing down to earth. It turned out that neither foreign nor local businessmen had taken seriously the notion that, as part of the electorate seemed to have come to its senses, they would be well-advised to invest their money in a country that would soon become an economic tiger. After expressing their approval of what the man was saying, they sat back and waited to see if his endeavours would bear any edible fruit. But then, as many had expected, things started to go wrong. Almost overnight, a bad harvest and the Fed’s decision to increase interest rates made Macri’s original “gradualist” game plan obsolete. Suddenly aware that the country was fast running out of money, he asked the International Monetary Fund (IMF) for help. To widespread surprise, Christine Lagarde proved willing to rubberstamp most of his economic programme, though the people around her evidently disliked seeing a trader skilled in the art of making a packet by playing the markets in charge of the Central Bank, hence the rapid departure of “the financial Messi,” Luis Caputo, from the government. As Macri must have foreseen, here at home his willingness to cosy up to the IMF did not go down well. Most Argentine politicians and intellectuals agree that, unlike them, the IMF ‘technicians’ know nothing about economics. From their point of view, asking such heartless incompetents for help was akin to calling for an undertaker when what was needed was a benign doctor. So Macri’s popularity slumped and the leading lights of the largely Peronist opposition began squabbling over who would move into the Pink House next year or even earlier. However, as the days passed, the excitement that had gripped the Peronist hopefuls began to abate. Macri may be in trouble, but he is still in there with a chance and it is by no means certain that any Peronist – even Cristina Fernández de Kirchner – whether in jail or still on the loose, could defeat him in a run-off should one prove necessary in late 2019. 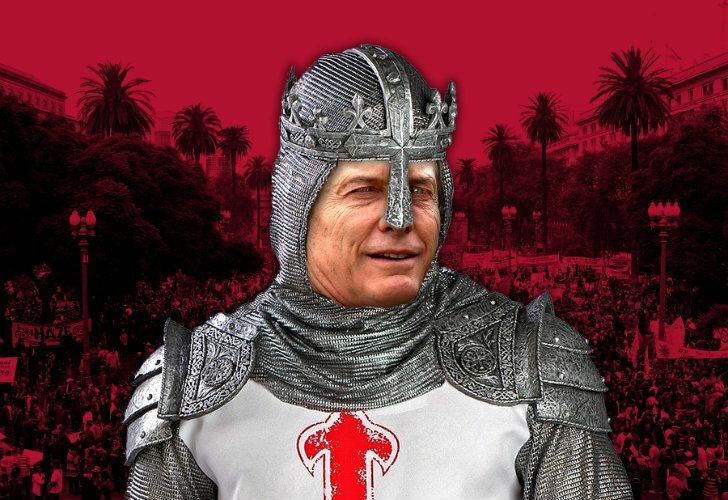 Macri’s tentative recovery can be attributed to his willingness to tell people he knows the country is in bad shape and that, no matter what happens, the next few years will be full of difficulties. Both the president and his current economic czar, Nicolás Dujovne, have stopped pretending that, thanks to their efforts, Argentina will make a painless transition from her regrettable present state into a world-beater. Instead, they go on about the tough times that lie ahead, the years it will take for their economic programme to produce enduring results and the certainty that the coming months will be full of unpleasant setbacks. Recent polls suggest that many find such realism appealing. Before the markets turned against Argentina, commentators of a sceptical disposition had been urging Macri to channel his inner Winston Churchill and warn people that it would be desperately hard for the country to overcome the huge backlog of problems it had accumulated since the Great Depression of the 1930s which put an end to a lengthy period of rapid growth and widespread prosperity by the standards of the time that most assumed were part of the natural order of things, a belief that, as time went by, would have a ruinous effect on the country’s political culture. Luckily for all of us, the situation Argentina is now in does not have much in common with the one confronted by Churchill in May 1940 when he offered his fellow Britons nothing but “blood, toil, tears and sweat.” The challenges are far less clear-cut, but so too are what will have to be done to overcome them. The country does not face invasion by a murderously efficient military machine but the threat of mass impoverishment brought about by the refusal to change their ways of corporatist groups whose beneficiaries are by and large satisfied with the way things are. Here, the forces of conservatism are strong, well-organised and lurk behind thick smokescreens of progressive rhetoric which ensure them the support of millions of poverty-stricken men and women who, had it not been for their alleged leaders’ ability to block change, would in all likelihood have become just as well-off as are middle- class northern Europeans. The many who scrape by as best they can on the fringes of the formal economy hold the key to Argentina’s future. For any economic restructuring programme to work, those responsible for it will have to win the support, or at least the acquiescence, of the large numbers of individuals who have grown used to depending on handouts and are therefore opposed to the cuts in public spending that most reasonable people, including “rational” Peronists such as Senator Miguel Angel Pichetto, agree are necessary. Like their counterparts in the rest of the world, they assume that it would be fairly easy to teach the many who rely on social welfare skills that would enable them to get those “quality jobs” Macri goes on about and earn a decent living, but as things stand, that is just wishful thinking. Something like what they have in mind would be realistic in Japan, China or Korea, countries whose traditions are well suited to the age of technologically driven economic development we are now living in, but for Argentina’s poor to emulate their East Asian contemporaries, they would first have to undergo some sweeping cultural changes, changes which much of the country’s elite would regard as reactionary and therefore unacceptable.